I think I dry-heaved the first time I realized that the Edible Arrangements logo contained one of the worst fonts ever created. I mean, Papyrus? Really? The company eventually redesigned its logo, but the damage was done. Sorry, Edible. I’m a forgiver, not a forgetter. 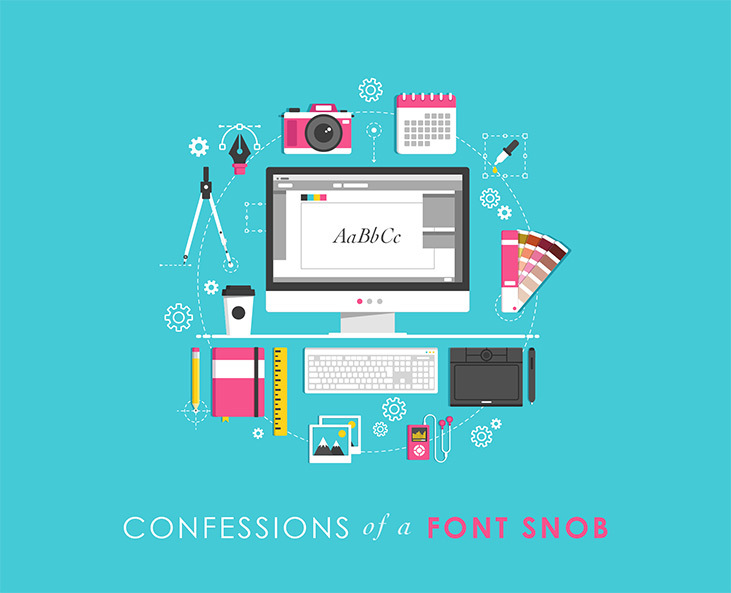 Hi, my name’s Katie, and I’m a font snob. Even Buzzfeed agrees. Not that I need a silly website to tell me one way or another. Being a font snob means I’m elated when a typeface comes with alternate glyphs and – oh, em, gee – LOOK WHAT I CAN DO. It means being irked by a font because it reminds me of something, yet I can’t put my finger on what, so I ponder and ponder some more until I finally realize that it looks like it belongs on the front of one of the outdated brochures collecting dust in a rack at my doctor’s office. Rule of thumb here, people: If you can envision a typeface declaring “Baby and Me” on a piece of paper circa 1991, SKIP IT. It means purgatory is a computer equipped with nothing but Mistral, Giddyup, Bradley Hand and Bleeding Cowboys. A graphic design professor of mine in college called these guys “trash” fonts because, like broccoli, black licorice and literally every movie Adam Sandler has made in the past decade, that’s ideally where they belong. Other typefaces that fall into this category include Curlz, Papyrus, Brush Script, Jokerman, Lucida Handwriting, and the trashiest of all trash fonts, Comic Sans. But I have a totally legit excuse for my snobbish behavior: Fonts are the foundation of design. They are the backbone, the glue, the spandex-y undergarment that holds everything in. Oh, and though they be but little, they are fierce. Typefaces hold power: the power to inflect meaning, the power to create harmony, the power to single-handedly make or break a design. A font can determine the overall feeling of a piece, sometimes conveying entire messages without really saying much at all. To gain a better understanding of just how influential fonts are, check out artist Steve Lovelace’s blog. There, he takes some of the most famous logos in the world and re-creates them using a different typeface. The results – which you can view here, here, here, here, here and here – are boring at best and hideous at worst: Pinterest loses its pizazz in Optima; Costco, in the monstrosity that’s Jokerman, makes me wonder if today’s free samples are going to be peddled by clowns; and Baskin Robbins, unremarkable in one of the most notorious fonts of all time, Helvetica, accomplishes the impossible and makes me completely uninterested in ice cream. Not my type: Donuts are dull in Times New Roman, and chocolate makes me want to skip it altogether and go to the disco instead. See what I mean when I say a font can single-handedly make or break a design? Fortunately, there are ways to keep the Dunkin’s and the Hershey’s of the world from crumbling like a tower of wonky Jenga blocks. For another, pick favorites. They’re not your children; it’s OK. I had a rag doll growing up that I was particularly fond of. (Slightly off-topic, but you’ll see where I’m going in a moment.) I don’t remember what I called her, but I do remember her pink gingham ensemble, as well as vaguely dropping her in the mud – but only once; I wasn’t that terrible of a doll mother. Ruby or Ruth or whatever her name was didn’t seem to mind wearing the same outfit 24/7 – it was sewn on, she had no choice – nor did she complain about her yarn hair, perpetually styled into a pair of matching yellow braids. (Also sewn on, also not her choice.) As far as dolls go, she was a good one. Sure, her feet were shaped funny and her lack of knees meant she’d never be an Olympian, but when all the other toys fell short, she was there. Eventually, though, I discovered the vast, bright pink world of Barbie, and Ruby/Ruth/whatever was stuffed into a cardboard box and demoted to garage sale material, but that’s not really important. While I’m too old for dolls now, I’ve found that the safe, dependable traits I admired in RubyRuthWhatever have carried over into other aspects of my life. Like when I go to Chipotle and my burrito bowl order is literally the same. Every. Single. Time. I like what I like, OK? Or when I’m designing and I need a body copy font that plays well with others and in swoops Century Gothic, the Mother Teresa of typefaces, to save the day. What I’m getting at here is that fonts are a lot like childhood toys. It doesn’t matter how many I own because I will always favor a certain few, and yeah, I might branch out and play with something new every now and then, but at the end of the day my loyalty’s unwavering, and if you aren’t Garamond, you can just see yourself out. Trusty, handy-dandy, reliable fonts are few and far between, so when I find one I like-like, I hold onto it, shower it with love and affection, and never ever let it go. Typefaces that catch (and ultimately keep) my attention end up in my fontourage. And my fontourage? Well, we roll deep. Fellow font snobs, feel free to roll with us. #squadgoals … or whatever the kiddos are saying these days.